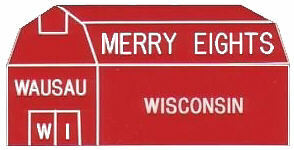 Dance Location *Wausau - Merry Eights**, (Sun, 1st, 3rd) "_New Time_" 2:00 - 4:30pm. *Enter at Fulton St. kitchen entrance; (NW corner of the building) and go down the stairs. Dancing is in the lower level. Mainstream /Plus every 3rd tip; Rounds when available.